Illustration of rowers at the earliest Henley Royal Regatta, two of them wearing henley shirts. The henley shirts were made of unbleached cotton, sometimes referred to as ecru, or white gauze for summertime, and wool for winter. The shirts remained popular with rowing teams until the 1940s. At some point in the 20th century (when is still unclear to me) a New York merchant was trying to sell men's undergarments to a Ralph Lauren buyer, who looked at the button-up undershirt and declared "This is a new shirt." Now, there's no telling if that was what really kicked off the henley-as-fashion-statement beginning, but it seems likely enough given henleys, and even T-shirts, were at best work or sports clothing, and at worst simply underwear and not something you'd wear out on the town. 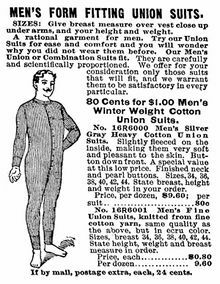 Men's henley shirts and union suits, from the 1922 Montgomery Ward catalog. A 1930s long-sleeve henley shirt. However, the timing on the T-shirt seemed a problem, as it would likely be ready sometime in winter. Aside from our Australian or Southeast Asian friends, it seemed to me that not many people would be interested in a short-sleeved T-shirt in December. Thus, I changed gears and began drawing up a long-sleeve henley. I love this as a garment because it's just as functional as it is attractive, and these days it's very much approved by polite society, maybe thanks to Ryan Gosling. "This shirt? Oh, it's OK. You should see the one The Rite Stuff is coming out with, babe." With design and buttons ready, it was time to wait again, but before that the sample for the scarves should arrive first!